The June 28 arrest and expulsion of Honduran President José Manuel “Mel” Zelaya by the country's armed forces has caused deep rifts between Hondurans on whether his removal should be considered a military coup or not. Roberto Micheletti, the speaker of parliament, was sworn into power by congress the same day the military flew Zelaya to Costa Rica in his pajamas. The conflict stems from an attempt by the Zelaya to hold a public consultation about a constitutional reform that would make it possible for him to run for president once more, disregarding current term limits. The consultation was determined to be illegal by the Honduras supreme court and congress. Additionally, Zelaya has been under scrutiny from other members of congress and the public for his friendships with Hugo Chavez in Venezuela and the Castro government in Cuba. Many remain loyal to Manuel Zelaya and/or strongly disagree with his forced and sudden removal. Meanwhile, there are also Hondurans who refuse to call the events “a coup” because the military were enforcing a ruling from the supreme court, as well as a vote from congress indicating that Zelaya committed “repeated violations of the constitution and the law.” Protests representing both sides have taken to the streets of Honduran cities, and the crisis remains unresolved. Many countries have condemned the action, and some have recalled their ambassadors in Tegucigalpa. The Organization of American States has suspended Honduras’ membership. 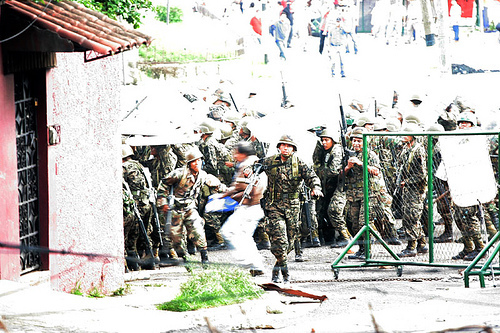 04 Jul – Honduras: Was it a Coup? You can also follow our coverage in Spanish on Global Voices en Español. Some are using videos to express their perspectives, and we bring you a few of them. This next video, shows the opposite view, and calls the event a coup d'état. The words in the video are translated below. Sunday June 28. The constitutional order is broken with the kidnapping and expulsion of the President of the Republic José Manuel Zelaya Rosales. Access to information is interrupted, electric energy is suspended, telephone, internet access, all national and international news channels are blocked, they take possession of the alternative news networks. They manipulate information through pro-coup networks. Popular organizations, civil organizations, LGBT, students, teacher organizations, women's feminists and others defend the Rule of Law in front of the Government offices. Men and women in the whole country defend the Rule of Law against the pro-coup members of the National Congress and Army. In the face of repression… lets defend the Rule of Law! Its not a change of power, ITS A COUP D'ETAT! This next video shows some of the violent events that have followed the change in power this past June 28th in spite of the new government's statements of how the situation is currently calm. The following photos by Flickr user rbreve in Honduras are 1) from an airport protest by people awaiting Zelaya's return from exile (he was not allowed to land), 2) from an anti-Zelaya march. This is a widget of a live search on Twitter for Tweets using the hashtag #Honduras.